When you live in the north, winter’s deep freeze can cost you cold hard cash. Turn the thermostat up and watch your bank account plummet along with the temperature. Before your personal finances hit zero along with the thermometer, learn how to keep your finances warm this winter. No doubt you know how to winterize your car. You make sure you have an ice scraper; you make certain you have the proper windshield wipers and fluid to handle the ice, snow, and slush. Maybe you even change to snow tires. You stash a blanket and granola bars in case of emergency. You also winterize your wardrobe: hat, gloves, warm coat, scarf, and boots. You learn to dress in layers as you move indoors and out. 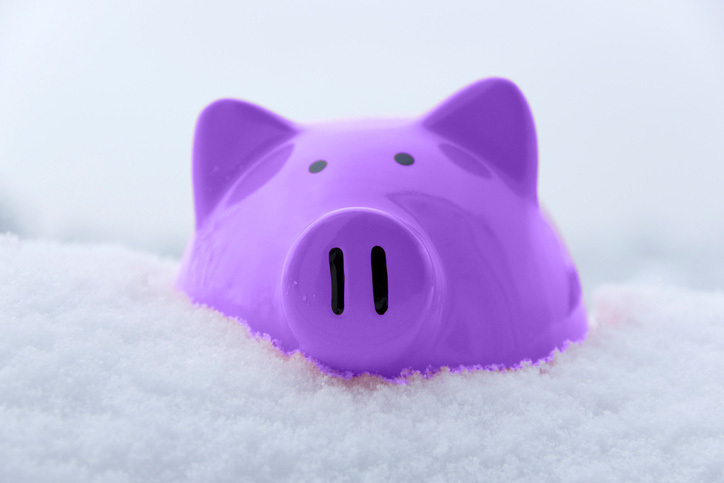 Now it’s time you gave as much thought to winterizing your personal finances. Warm them up one degree at a time. In order to keep your finances warm this winter, you need to start with a winter forecast. It’s easier to make a plan for your finances when you know what you’re up against. When the weatherman says a blizzard is coming, you know you head to the grocery store and stock up. Do the same for your budget! Winter finances can be strained and drained by a perfect storm: holiday gift giving, heating bills, and upcoming tax time. You need to fatten that wallet now while you can! Take a lesson from Aesop’s fable of the grasshopper and the ant and get started now. Small changes can have a big impact. In winter, the heating bill moves up to the big three monthly expenses for most people: rent or mortgage, groceries, and heating. Turning the thermostat down by even one degree can lower your heating bill without a noticeable decrease in comfort. Turn the thermometer down by 10 degrees at night while you sleep. Invest in a warm blanket and flannel sheets. That expense will be more than repaid by the savings you’ll generate. And you’ll sleep better, too! Keep your thermostat at 60 to 65 degrees, and wear a sweater while you’re home. Snuggle up with a fleece blanket while you watch TV at night. Program your thermostat to lower the temperature while you’re at work and to warm up when you return. Why heat the house when no one is there? You’ll save some cash without feeling like Scrooge. Change your furnace filter; it will keep your air cleaner and let the furnace operate more efficiently! You’ll breathe easier, too. Humidify your house. Moisture in the air makes it feel warmer! Houseplants also contribute. Close off unused rooms. No guest in the guest room? Close the door and shut off the heat vent. Keep out the drafts! Check your doors to make sure they are properly weather-stripped. Let the sun in during the day and close curtains at night. Thermal lined drapes help keep the cold at bay. All these low or no-cost actions will help keep your finances warm this winter without draining your wallet. For additional tips, check out the websites listed below. There are plenty of ways to lower your heating bill and still stay warm. Like the grasshopper in Aesop’s fable, when we’re having summer fun at the lake, we aren’t thinking about Michigan winters. Most of us don’t have the discipline to tuck away extra dollars in summer to cover the heating bill in the winter. If your energy provider has an even payment plan, it can help you stick to your budget and make it easier on your personal finances. Having a predictable energy bill will smooth out the roller coaster ride of trying to pay an exorbitant heating bill in January when you’re trying to pay off the holiday gifts on your credit card. Planning and paying ahead helps you avoid late payments, which keeps even more bucks in your wallet. Once your heating bill is leveled out over the course of the year, United Financial can help you set up an automatic payment to take care of it. You’ll no longer be worried what next month’s heating bill will be. You already know what it is regardless of the weather forecast. If you haven’t used United Financial’s BudgetSmart software yet, winter is a great time to plug in the numbers. You’ll gain a more accurate picture of your monthly expenses: where you’re spending too much and where you could save more. Wouldn’t it feel good to end the year with your personal finances in the black? Just download BudgetSmart and get started! It’s free! Consider it our house-warming gift to you. Depending on the age of your home, you might be due for an energy audit. How much heat are you losing because you don’t have enough insulation in the attic or walls? You’re losing some hard-earned income along with the heat. How much heat are you losing because your windows are only single-pane? How old is your furnace? Do you know how energy efficient it is (or isn’t)? Addressing these issues can cost you big bucks. A new furnace doesn’t come cheap. And the cost of a houseful of windows could send chills down your spine! United Financial can take some of the worry out of these expenses. We have loan options to help you finance your home improvements. If you have built up enough equity in your home, you could consider a home equity loan to finance your improvements. This option generally offers a low interest rate because the loan is secured with your house as collateral. If you don’t have sufficient equity to borrow against your home, you could consider a personal loan. Either way, a loan to improve your home by making it energy efficient can be a smart investment. Keeping your home, your biggest asset, updated and well maintained can make sense for your overall personal finances. Grasshopper, listen up! Those industrious ants that worked all summer will be snug all winter because they prepared for winter. You don’t have to go hungry or shiver in the cold! Following even a few of these suggestions will keep your finances warm this winter. Need more advice? Come talk with one of our financial experts at United Financial. We can help you put together a whole package of financial options with savings and investments along with loans and lines of credit to meet your specific needs. Small changes over time can reap big benefits later. Develop the habits of those industrious future-thinking ants. Or let that other plucky ant of song inspire you. Everybody knows an ant can’t move a rubber tree plant. But he had high hopes! Persist and your personal finances will improve. When you keep making small changes in your spending and saving habits, you’ll be surprised what you can accomplish. Be like an ant and never say, “Can’t”!